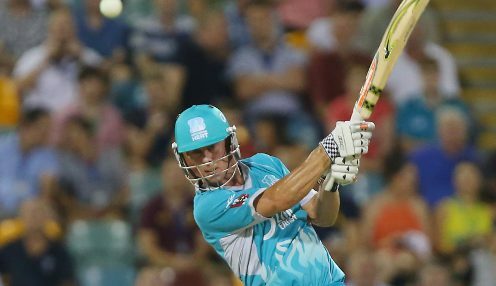 Chris Lynn made his 16th Big Bash League half-century to help preserve Brisbane Heat's mathematical chance of making the finals with a win over Perth Scorchers. The Heat won by six wickets at the Gabba, leaving the visitors staring at a last-place finish this season. Perth finished top of the ladder last season, with eight wins from ten matches, but they have a 3-9 record this time and this was their fourth straight loss. Lynn became the BBL's all-time top run scorer as he made an unbeaten 56 to leapfrog Scorchers veteran Michael Klinger - left out for this match - on the list. He put on 57 for the second wicket with Max Bryant and hit four sixes and three fours in his 39-ball innings to help get Brisbane home in 17.3 overs. The Scorchers, who were also without Shaun Marsh due to a hamstring niggle, were restricted to 128-9. Mujeeb Ur Rahman and Josh Lalor both took three wickets for Brisbane, with Lalor claiming the BBL's fourth hat-trick in strange fashion. Mystery spinner Mujeeb took three top-order wickets while seamer Lalor claimed his first scalp when Andrew Tye was caught by Lynn at long-off from the last ball of the 18th penultimate over. He dismissed Matthew Kelly and Nick Hobson with the first two deliveries of the final over of the innings. Hobson was the Scorchers' top scorer with 43 from 35 balls, sharing a sixth-wicket stand of 39 with debutant Clint Hinchcliffe, while Cameron Bancroft made 32 from 24 deliveries. Brisbane are 13/10 to finish in the top four. The Heat are 6/5 to win their next match against Adelaide Strikers, who are 8/11.